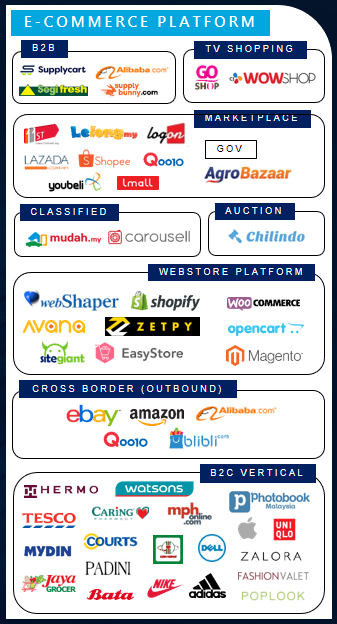 There are a few criteria on how we map the e-commerce ecosystem Malaysia, by focusing on key players who involved directly, or indirectly in the online transactions of physical goods. Certain verticals like properties, cars, travel, ticketing are being omitted here. The last time we compiled something similar and simpler was almost 5 years ago (how fast things can change), it is time to lay out the e-commerce landscape in Malaysia again with the industry booming here in recent years. 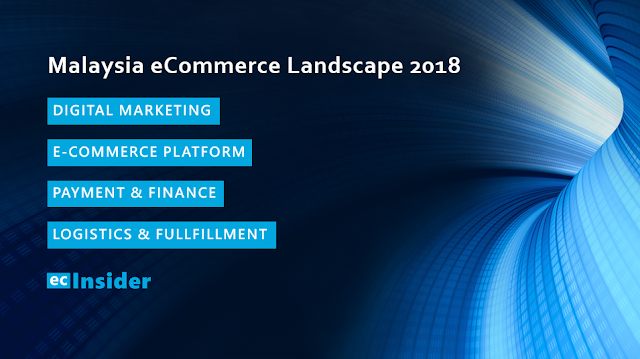 The e-commerce ecosystem will only be complete with four pillars, namely digital marketing, e-commerce platform, payment & finance, logistics & fulfillment. Hence, this is the way we are structuring and listing the key players in each category. Obviously, the e-commerce ecosystem is dynamic and fast-changing as ever. As time goes by, we will update this landscape as it deemed necessary. Some of the new categories we foresee to include are the emerging fields such as O2O (or "OMO" to some, Online-Merge-Offline), AI etc. We will go by category so read on, or you can scroll all the way to the bottom for full landscape in infographic. Are you an e-commerce platform, service provider or agency? When you are selling online especially via your own branded store, digital marketing is a must so you either need to do it in-house or outsource it to a digital agency. Besides the popular ad platforms, social media channels and email marketing, the other options you can consider are affiliate / cashback / loyalty programs. If you are an Internet noob or beginner, you might also want to consider e-commerce or digital marketing training to beef up your knowledge first. 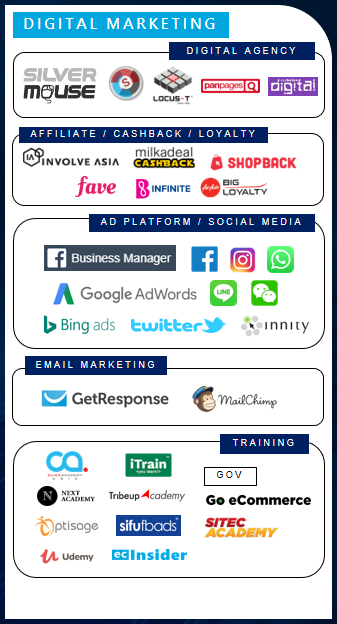 There are hundreds of digital agencies in Malaysia from big to small ones but we shortlisted those with deep e-commerce know-how and sizeable clients. Most of them offer core service to handle your Google AdWords and Facebook / Instagram advertising campaigns with some of them specializing in services like SEO, influencer marketing, content development, creative design, video production etc. too. If you are an e-commerce merchant then you are no stranger to affiliate or cashback scheme, in which you only pay for cost per sale or CPA (Cost per Acquisition). In terms of loyalty, there are a couple of programs initiated by the merchants itself but here we shortlisted wide-scale loyalty programs usable in major e-commerce sites in Malaysia. If you are making a living online, you must have known or used the self-service advertising platforms by Facebook and Google. Just engage one of the digital agencies if you don't know how to do it, or you aren't sure on how to do it well. Online advertising platforms are not just limited by the "big two", as you can also explore options like affiliate programs above, or mobile chat app marketing solutions, Bing ads, Twitter ads etc. While marketing solutions above generally focus on driving acquisitions (for example, getting new customers), email marketing is good for customers' communication and retention. There are quite a couple of email marketing solutions available globally, but popular ones are MailChimp and GetResponse in particular, has set up a local office in Malaysia. Wanna brush up your e-commerce or digital marketing skills? Do consider attending training (physically) or eLearning organized by private institutions or the government initiatives. Just take note that each training providers are specializing in respective areas like digital advertising, Google Analytics, Facebook marketing, e-commerce disciplines and so on. Even before considering digital marketing solutions, e-commerce platform is the one you should kickstart your online business journey. This is the first step to set up your online presence, webstore or simply, just listing your products online. Are you selling locally or overseas? Are you selling to end consumers (B2C) or businesses (B2B)? Do you intend to sell via marketplaces, or set up your own store, or both? Online B2B platforms can work two ways - selling and sourcing products for your business. While Alibaba enables you to source or sell almost anything under the roof, there are other local B2B sites which focus on certain niches like office and pantry supplies, stationery, grocery and even restaurant supplies. There were a few TV shopping brands in the market previously but it has come down to a battle between two local media conglomerates: Astro GO SHOP vs CJ WOW Shop (by Media Prima), both with a Korean partner respectively. With TV Shopping channel raking tens of millions annually, this could be a lucrative avenue for merchants or brands to sell hero products. The online marketplace is arguably the easiest way to sell online especially for beginners, leveraging its huge traffic and customers base. A big chunk of local online sales is happening here, with physical products filled by cross-border, local merchants, retailers, and brands. If you refer to our e-commerce history and milestones in Malaysia, e-marketplace battle is the third wave which stimulates the e-commerce growth here. This is a super competitive and capital-intensive field led by the big-two (or big-four depending on how you see it), with many others had gone into the dead pool. Not to be confused with e-marketplace, classified mainly facilitates the trade of used items or listing of property, cars etc. In simpler words, this is like a newspaper classified transformed online. Instead of ordering from online merchants (B2C), classified is C2C-driven with buyers have to negotiate, deal and pay the individual sellers either via bank transfer or COD. Mudah has been the household brand here with Carousell from Singapore entering the field since a few years ago, will Facebook Marketplace makes its entry here soon? If you are to set up your own-branded store, you can either go for SaaS (Software-as-a-Service) platform or source for web developers to implement the open-source shopping cart. Since many merchants are selling multi-channel, the capability to sync products and orders to/from marketplaces is becoming a sought-after feature of the shopping cart. There are also standalone multi-channel tools like Zetpy without the need of a webstore. Is Malaysia a market too small for you? You can always consider global marketplaces if you are aspired to expand your e-commerce business to overseas. There are quite a number of untold cross-border success stories by local entrepreneurs, you can find out some of them in our Unboxing eCommerce Entrepreneurs book. Besides e-marketplaces, a chunk of online transactions is contributed by a number of online B2C sites which focus on certain verticals like health & beauty, fashion & accessories etc. While this is not a platform for you to set up your direct e-commerce presence, you can still supply your products to B2C sites especially if you are brand owners in certain categories. Digital payment is definitely getting a lot of tractions especially in markets with growing e-commerce penetration, and this is happening in Malaysia too. Fintech (financial technology) is the buzzword nowadays, as financial industry is no longer monopolized by traditional institutions. Internet businesses from startups to conglomerates are moving fast in this arena to give banks a run for their money. If you are setting up shop online, offering e-payment is a must. Bigger merchants or existing retailers might opt for connecting straight to the banks, while most online merchants are already aware of the options offered by online payment gateway companies. To recap, local online payment gateway enables you to accept payments via both online bank transfer and credit / debit card. A must if you are selling locally, as the majority of online orders here are transacted via these two payment methods. Are you planning to sell at global marketplaces like Amazon or Alibaba? If so, you might require international money transfer service like Payoneer to receive overseas payments and remit money back to Malaysia. On another hand, Money match is a cost-effective way to remit payment to overseas, which might be useful for businesses that import or export. We are probably witnessing the dawn of eWallet battle here, with many new players backed by big corporations entering the field, and most of them are non-banks though. 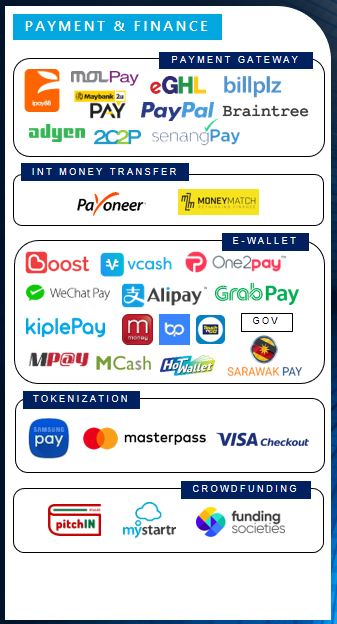 A special mention to Sarawak Pay, a unique case of state-initiated e-wallet. There are two types of e-wallets: network-based like Boost, Vcash, kiplePay, Touch 'n Go, GrabPay etc, and card-based like BigPay, ManagePay (both Mastercard Prepaid), Merchantrade Money (Visa Prepaid) etc. Stay tuned as we will have more e-wallet content lining up this year. Tokenization enables mobile payments to be more secure by attaching a card number to a digital wallet with a unique identifier that’s passed between the wallet, merchant, and other relevant parties. Samsung Pay, supports MST (Magnetic Secure Transmission), NFC, which can be widely accepted by major retailers in the country. Meanwhile, Masterpass is supported by TGV and Visa Checkout is supported by GSC. Moving on from digital payments, some e-commerce businesses are capital intensive so financing is required to kickstart or scale the business. You might want to read 8 ways to finance your e-commerce business while we shortlist the crowdfunding players here. There are generally three types of crowdfunding in Malaysia: equity crowdfunding like pitchIN, reward crowdfunding like Mystartr, lending crowdfunding like Funding Societies. Say you've got your webstore, online payment ready, digital marketing campaigns activated and traffic, orders are coming in so what's next? Logistics & fulfillment is next on your list. As opposed to financial technology with many non-bank startups, logistics is a capital or assets heavy model hence there are many traditional logistics companies on this list, especially those in last mile delivery. Third-party logistics (abbreviated 3PL, or sometimes TPL), is where you outsource your orders fulfillment or shipping. Industry players mentioned here are mainly focused on last mile delivery, and these names are no stranger to anyone who is selling online here. While 3PL above focus on domestic, this section specialize in export. 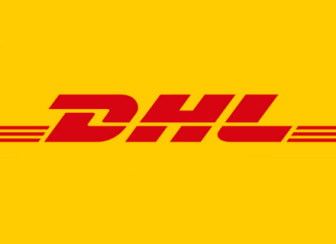 Particularly on DHL, not to be confused as DHL eCommerce focus on local, while DHL Express focus on cross-border. Not sure which last mile or courier providers to go with? You can log on to 3PL marketplace to compare shipping rates based on your requirements. There are two major aggregators in this segment, with EasyParcel founded in Penang while SHIPPOP is originated from Thailand. If you are considering to outsource the entire fulfillment process from pick, pack to ship then you can check out some of the fulfillment service providers here. This is also very relevant for brands who are focusing entirely on marketplaces for online sales. We have recently published an article with in-depth analysis of major food delivery companies in Malaysia. On top of that, we have included grocery delivery companies like HappyFresh here. If you are running restaurants, cafe or even grocery, this is something you can consider to easily expand your business online by collaborating with these players. On-demand service is like a personal helper to your business, you can order such service to despatch a document, pickup a cheque, or even ship a same-day, last-minute parcel to your customer. Similar to food and grocery delivery, this segment is filled by Internet startups and the challenge is always to scale up the coverage area, and cope with growing demands. How does it work? Alternate pickup providers partner with retailers who own multiple physical stores, which act as a pickup point for customers to collect or return parcels. What's in for retailers? Footfall, but it will be challenging to educate the store staffs (they might be tasked to prioritize sales instead of such servicing) and furthermore, changing customers behaviour. Similar to alternate pickup, parcel locker offers another pickup option especially for consumers who are always on the move (not at home, or not convenient to ship parcels to office). Located at premises like colleges, residential or commercial buildings and so on, parcel locker also play a role (revenue) as an out-of-home inventory for advertisers. Our e-commerce ecosystem can only grow and flourish with support by the government, and Malaysia Digital Economy Corporation (MDEC) is spearheading programs like #MYCYBERSALE, National eCommerce Strategic Roadmap, DFTZ etc. 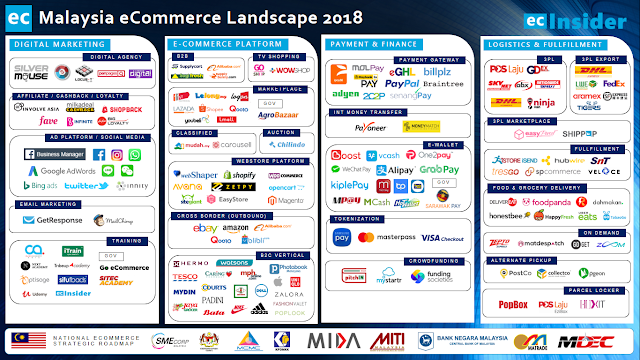 Under the National eCommerce Strategic Roadmap, the National eCommerce Council (NeCC), comprising of various Ministries and Agencies, was established to drive the implementation of the roadmap towards doubling Malaysia’s eCommerce growth rate and reach a GDP contribution of RM 211 billion by 2020. Promote and market eCommerce to SMEs. Improve the scale and effectiveness of SME eCommerce training and talent development. Create a one-stop e-business portal for SMEs. Require government agencies to use eProcurement to buy goods and services. Encourage government-linked companies to use eProcurement. Transform Malaysia’s last-mile delivery network with best-in-class capabilities. Transform Malaysia into a regional e-fulfillment hub. Reduce border clearance lead time for inbound and outbound parcels. Increase awareness of e-payment innovations, benefits, and security. Promote Malaysian brands in international marketplaces. * Above is extracted from MDEC website. So here you go, you can also view the full infographic on Pinterest, or download free PDF via the button below. While we hold the final decision to review and list key players in this chart, feel free to leave a comment below if you have any feedback or suggestion.